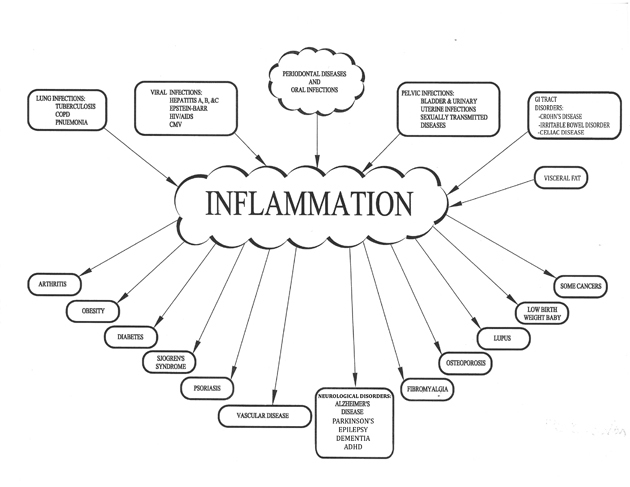 The entire area of diseases that are caused by inflammation is an area that has received considerable attention in recent years. This was explained earlier in the foreword section but I will restate it in much simpler terms here. The simple explanation is this: Chronic untreated infections produce a lot of chemical products that are released into the bloodstream and travel to all the other tissues and organs in the body where they can cause damage. It seems to me that these problems should not be called diseases per se but instead they are just symptoms of the primary, untreated infection. Dental infections are not always the cause of the problem but there are not too many locations where chronic infections are left unattended. The other areas where bacteria are known to hide are in the genito-urinary area, the large intestine, the lungs, and there are some chronic viral infections that could play a part. Vascular Diseases – The initial damage to the inner lining of the arteries seems to be the result of products of inflammation such as C-Reactive protein and various cytokines. This is where the lipid blocks start to form. When these get large they can rupture for other reasons of dental origin. Diabetes – While this is primarily a problem of carbohydrate metabolism the case can be made that products of inflammation may contribute to the initial damage to the pancreas and they definitely make the problem worse once it has started. Osteoporosis – This is again an inflammatory mechanism. Periodontal pathogens cause immune cells to release cytokines, interleukin, and prostaglandins. These lead to an uncoupling of normal bone homeostasis and increased osteoclastic activity. Obesity – Inflammation may interfere with the action of the thyroid causing a hypothyroid-like condition. Also, since periodontal disease can cause a worsening of diabetes with its hyperglycemia; this too could interfere with fat metabolism and sugar that is not taken into muscles could be stored as fat instead. Rheumatoid Arthritis – This disease has long been suspected to be somehow associated with a dental infection but no sound mechanism has been forthcoming. In some studies the disease does respond positively to antibiotics leading some to believe that some form of streptococci may play a role. There is some C-Reactive protein found in the joints but could be the direct result of damaged tissues. Also some antigens to spirochetes can be found in synovial fluid sometimes. Spirochetes are a bacteria that become common in the more advanced stages of periodontal disease. Low birth weight Babies – The mechanism at work here is again inflammatory in nature. Inflammation products such as prostaglandins, cytokines, and interleukin apparently can stimulate the early onset of labour. When this occurs the baby is delivered preterm and is therefore of low birth weigh. Sjogren’s Syndrome – This is a collection of symptoms believed to be the result of damage to various glands due to inflammation. The main glands affected are the tear ducts and salivary glands leading to dry mouth and dry eyes. However, in some cases it is thought that the Thyroid gland is also affected. This leads to fatigue, weight gain, cold extremities, dry skin and hair. Also, sometimes joints are affected in a condition that resembles Rheumatoid arthritis.